Such was the hate pouring in that I had to shut the comments section in order to keep myself sane. Now, this doesn't mean that we are going to get silent or not expose. But no point in arguing with anybody and the same issues that keep popping up after every few months. Ten yrs from now too, there'll be same debates over Vande Matram or Yoga, Bharat Mata or Saraswati Vandana. Sometimes it feels that this is a strategy, a trap too. The moment you are in explanatory mode, you are on back foot and you explain things sincerely, the other guy would be ready with his list--now what about this! 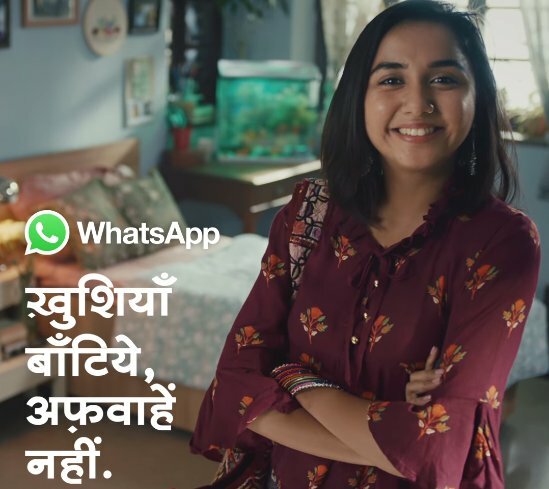 WhatsApp has finally woken up from its slumber. It has begun a campaign--Khushiyaan baantiye, Afwaahein nahin. If translated from Urdu to English, it says--spread happiness, not falsehoods. After rumours and false propaganda was spread on this platform for long, it has apparently bowed to pressure. Government of India had also asked it to contain the spread of hate and rumours that resulted in incidents of lynchings. The rumours about cow or gangs on the prowl to abduct kids, had led to attacks, lynchings and even deaths. A techie was killed in Karnataka. 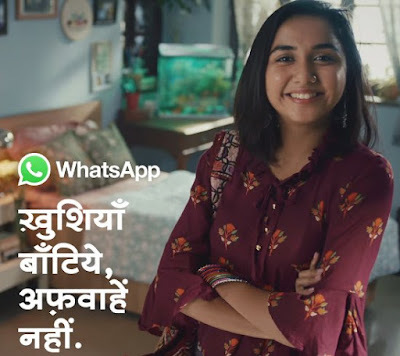 In fact, many other such serious incidents of law-and-order failure took place because of WhatsApp and the rumours spread through the platform. Inside WhatsApp groups, people share content with like minded people or friends-families. 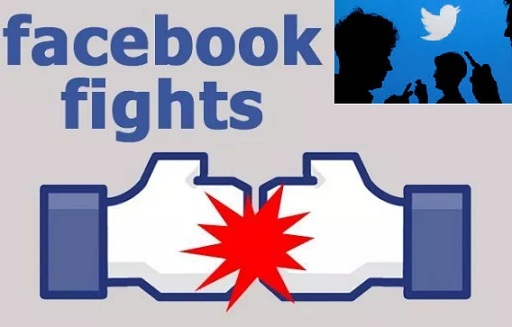 Apart from Facebook, it is another major platform that can let any content go viral within a few hours. Hence, there is need for more responsibility on part of WhatsApp. It has taken it years for the social media giant to run such an advertisement campaign. Now it is on TV and is also visible at other places. Quite late. Had they been vigilant earlier, it may have saved lives. If people are aware that they may be caught, they are more cautious. In fact, WhatsApp need to do even more and be strict with people who spread false messages and share fake news. 'Our tax money' or 'We pay taxes' is the line heard so much that it is almost sickening now in India. Everybody who earns a few lakhs or even crores, feel they are all middle-class and are doing a great favour to the country by paying taxes. And, when there is a farm waiver, just see the anger, as if it is our money that is being misused. If agriculture sector is in crisis or there is a major drought, government will have to act, just like it does in case of failing industry. But when industry fails after getting land at throw away prices and rebates without even generation too many jobs or a public sector undertaking needs bailout package, there is no such anger. Those 'thousands of crores' aren't visible to you? Or the thousands of crores gifted to foreign countries like Maldives or Mauritius. Is it because people managing them and those who fail them, are 'like us'--the urban people, not the rural folk! I am going to start it from the very basic. Just look at this photograph. 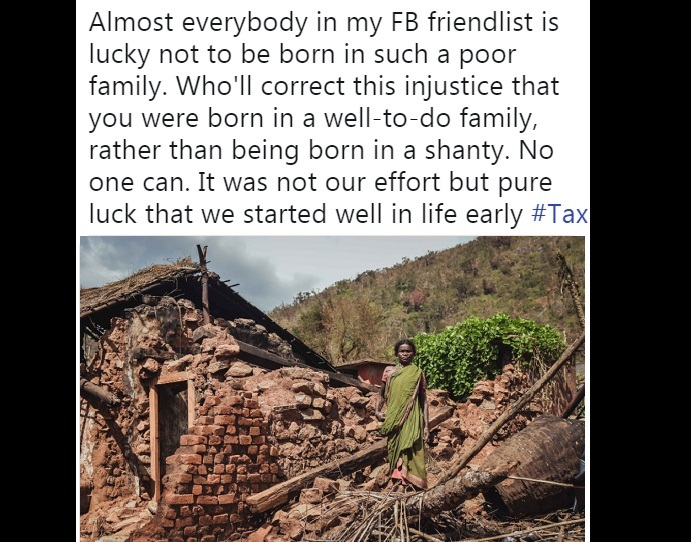 Almost everybody in my Facebook friendlist is lucky not to be born in such a poor family. Who'll correct this injustice that you were born in a well-to-do family, rather than being born in a shanty? No one can. It was not our effort but pure luck that we started well in life early. Yes, you've huge privilege if you pay tax. You claim to love your country, you are a patriot. Okay, you are privileged, so you feel paying tax is also an 'ehsan' [favour] on your country? Think again, this is patriotism? This is the love for your own people--the countrymen? No outrage on malnutrition deaths, children dying because of hunger but angry over Tax. Sense of entitlement! No, we'll selfishly cry despite our privileges. You spend as much on dinner in a hotel that is sufficient for these families to run the household for month. Yet, fat-bellied class feels the pinch, most. Yes there is corruption, all funds don't reach but what is not flawed around? Kis pe ehsaan kar rahe ho be, tax de kar? Apne desh pe? If 10,000 farmers commit suicide in a year, and a loan waiver saves a few thousand lives out of them--a few thousand human beings saved, even then it is something huge that you attain for the nation. And, please don't bring BJP-Congress argument in it. Just that we should keep our morals, be sensitive, less selfish and try to understand the woes of the farmer. Remember, the grains we all need to fill our bellies don't come out of software. They are the result of farmers' hard labour. So be kind and less arrogant---SRA. Eminent author Ashok Kumar Pandey says that the middle-class takes great pride in paying taxes, feels that it's their tax money that runs the country. "Major part of tax incomes are spent on infrastructure building in cities where the middle-class lives. It is this class that uses the roads, parks, metro, power, library, universities, sanitation,the most. So either it is the engines that run on heavily subsidised fuels or the money paid on his security." "Farmer lives in villages that have bad roads, no sanitation, lack of drinking water, poor health services, hardly any security, even has no role in fixing the prices of crops that he grows", writes Pandey in a long Facebook post. 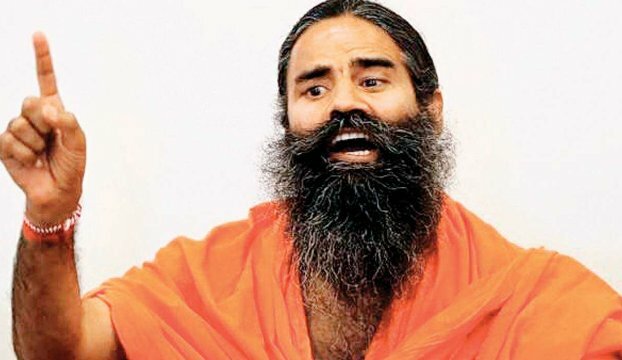 "No one wants to take loan, farmer doesn't get right amount for his crop, even insurance schemes are flawed, he is forced into a competition with subsidized international market and if in this situation, he is suffers and gets some relief in the form of loan waiver, it is his right", he further mentions. 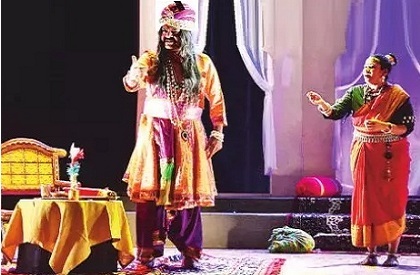 SHAME: Who is Yoga guru Ramdev to ask Naseeruddin Shah to leave the country? As veteran actor Naseeruddin Shah expressed his fears--how life of a cow has become more important that that of a human being, it seemed all hell broke loose. Once again, the chorus--leave the country, began. 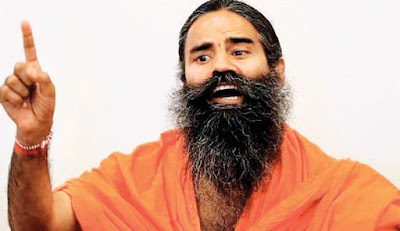 Yoga guru Swami Ramdev was among the first to react on TV--advising Naseeruddin Shah to leave the country. Isn't it extraordinary arrogance and objectionable? Who gives them the authority to make such announcements? 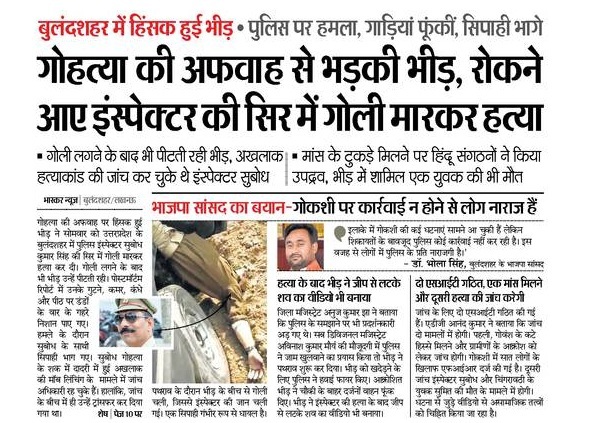 Only recently, a right-wing extremist mob attacked a police station, killed an inspector in cold-blood and the assailants are yet to be arrested. Worse, UP politicians tried to give it a spin and the local police first claimed arresting those responsible for animal slaughter. Later, police again accepted that they had made wrong arrests. Those who were caught, were in fact innocent people. So some other people were arrested. 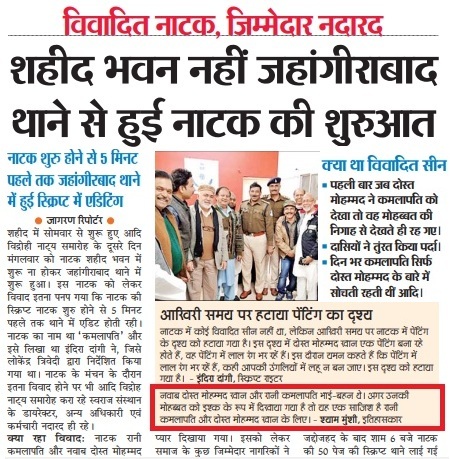 This is despite suspicion of conspiracy that it was all staged because there was a plan to create communal tension during the Ijtima in Bulandshahr. Now, in such a situation when even killers of police officials are scot-free and release their videos, an actor expresses concern. But he is targeted and told to leave the country and go to another place! Isn't this disgusting! Who won't be worried? Louts are calling the shots. Naseeruddin Shah is not a commoner but on the ground right-wingers are issuing threats--take out rally in Delhi threatening to pull down Jama Masjid (and no one arrested), or attacking policemen. You switch on the TV & the debates you watch, the reactions of right-wingers, who won't get paranoid? And you ask people to leave? If someone in your family says he or she is scared, will you comfort them or thrown them out? Clearly, your definition of house or family is wrong. May be because you don't have a family or you don't consider your countrymen as your own. And you're not an ascetic but a Saffron-robed businessman who is plain arrogant and seems to have little concern for his country-men. It is another heart-warming story that tells about how communal harmony exists on the ground and people go extra-mile to help other communities. The Muslim woman decided to donate own land for construction of temple. Not just her husband but entire family including the son, supported her decision. This incident has occurred in Uttar Pradesh--the same state from where we get so much bad news--crime and lynching incidents. This is all the more important as UP is the same state where the dispute at Ayodhya continues for ages and hundreds have died in communal clashes across the country, over the temple-mosque dispute. According to reports, Akbari, who lives in Siwalkhas, nearly 20 kms away from Meerut, was approached by local residents who wanted a donation for construction of temple. Rather than donating a few hundred rupees, she instantly committed that she would give her own land--more than 1,350 sq ft [150 sq yards]. This is indeed exemplary and rare. Her husband was not at home then. When he returned, he supported his wife's stand. Aas Mohammad is a retired teacher. 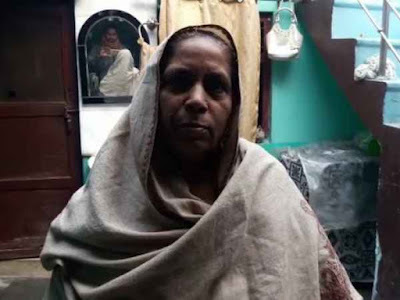 His wife Akbari says that when the delegation of local Hindus arrived at her house, she felt that she had donated for construction and repair of mosques earlier, so she offered the land to temple. Siwalkhas is located on Meerut-Baghpat highway. It has nearly 80% Muslim population. People like Master Ram Gopal, Ravinder Sharma and local Hindus who were part of the delegation were overwhelmed. Now, the agreement has been finalised on paper. It has been a talk of the town and also in neighbouring cities, that how a Muslim woman took the decision in the times when land prices have skyrocketed. What's the sure-shot way to get 'success' as a bureaucrat, if the definition of success is money and power and your sole aim is to call the shots in administration! Those who have been in Madhya Pradesh, are well aware of how it can happen. 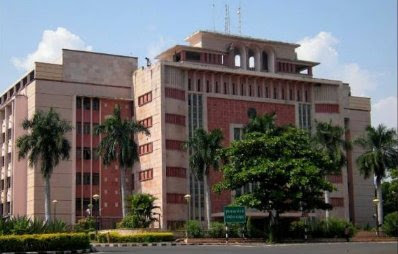 After all, the most powerful bureaucrat in the state, has just now lost his 'power'. Though he had retired long back, he remained powerful and was appointed on contract. This is quite a long story, tells how section of bureaucracy works.Years ago, during election, an officer sat at a powerful politician's feet, in full public view. This brought him bad press and also earned EC ire for a while. But that was nothing compared to the benefits that were to come in later years. He went on to become most powerful IAS officer in Madhya Pradesh. So much that his word became the law. Anyone may be principal secretary or head of another department, the real power was with this guy. So how's that--isn't such show of loyalty worth it? This has an impact on young officers who see and learn that the way to attaining power & success, fast, is to be someone's guy, throw rule book out and just do all the malpractices--servility and sycophancy, closing eyes to corruption, rather than toiling hard & live your life with idealism. Extremists chanting slogans against Jama Masjid--'Ek Dhakka Aur Do, Jama Masjid Tod Do' walked on the streets of India's national capital. 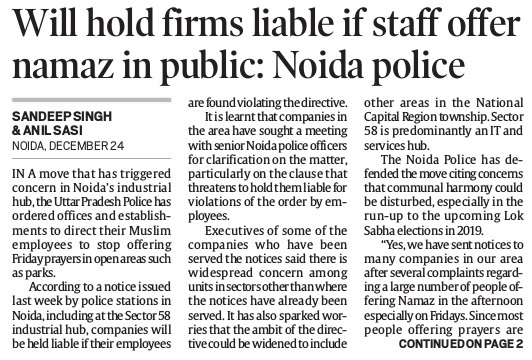 It means, 'One more push, Demolish the Jama Masjid'. Clearly, it is not just about Babri Masjid, but the hate and madness has now reached Delhi. This militant march was taken out just a day after 'Dharm Sansad', ironically, that means 'Religious Parliament'. Most of the participants in this strange rally, were those who had come to attend the event. Does religion teach this? Doesn't it terrorise Muslims, who are already feeling besieged, as Hindu groups announce plans to build Ram Temple in Ayodhya, though Supreme Court is yet to announce a verdict and the case is still sub-judice. This is happening when we are witnessing lynchings in the name of cow, people being beaten on streets, even policemen attacked and an officer killed by militant right-wing extremists in Bulandshahr. How far will this go? 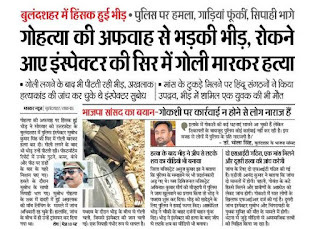 When will the state, the police take action? It is not just affecting India's composite culture, it is also damaging India's reputation across the world. Many people expressed their outrage after the incident. This is not the first such incident. Recently, a BJP leader had ambushed into the historic mosque and forcibly unfurled the national flag. Earlier this year, swords were brandished and saffron flags waved in rally taken out in front of several mosques in Delhi. 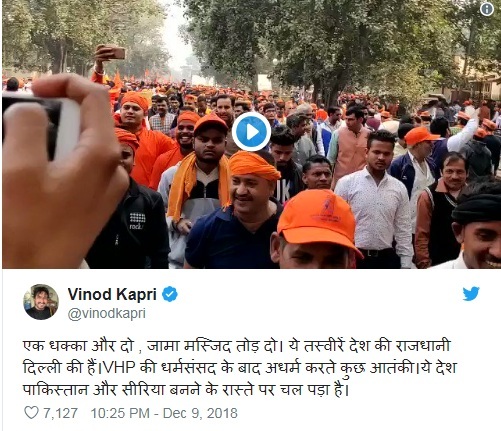 Senior journalist Vinod Kapri tweeted and termed it 'adharma' (anti-religious act). A few links below about the incident that alarmed the citizens about the level of righ-wing radicalization and indoctrination in India. In a shocking incident, an armed mob attacked a police station and killed two persons including a police official. The attackers were led by right-wing extremist militia Bajrang Dal leaders. The main accused, Yogesh Raj, has been charged with engineering the mob violence. This incident occurred in Bulandshahar district. First, it was rumour-mongering over carcass of a dead animal. This was used to mobilize the people. Hundreds came from outside and demanded action. When the mob turned violent, police tried to control them. But there was attack, firing and two persons including the police official, Subodh Kumar Singh, were killed. Singh was shot in the head. A youth, Sumit, 21, also died in the brutal attack. Such was the situation that the mob chased and attacked the police personnel who were present at the spot. Some had to break the wall of the police outpost in order to escape and save themselves from the killers. 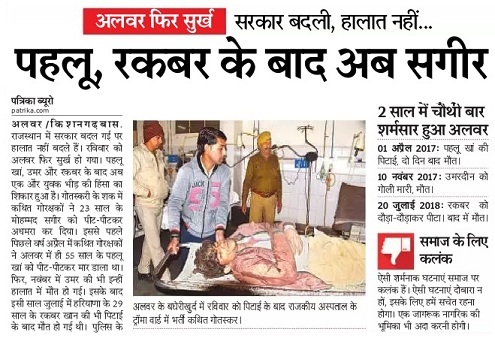 In fact, Subodh Kumar Singh was being taken to hospital when he was attacked, again. He later succumbed to the injuries. This incident has led to shockwaves across the country. 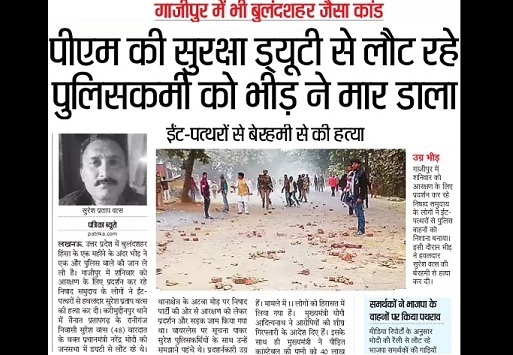 Bajrang Dal members, VHP cadre and BJP leaders have been found involved in inciting the mob. Yogesh Raj's Facebook and Twitter posts suggest how radicalised, he was. His social media handles reflect the intense hatred and give an indication about his plans. Yet, there has been little focus on this aspect. Most newspapers have ignored these inflammatory posts (some posts have been deleted, it appears, just now).